Take Me To The Pilot: 'American Made' Soars Doug Liman's "cheerfully blistering yarn" about a pilot who flew guns and drugs for the CIA makes the most of Tom Cruise's gifts as a leading man, and Liman's directorial fondness for low-level chaos. 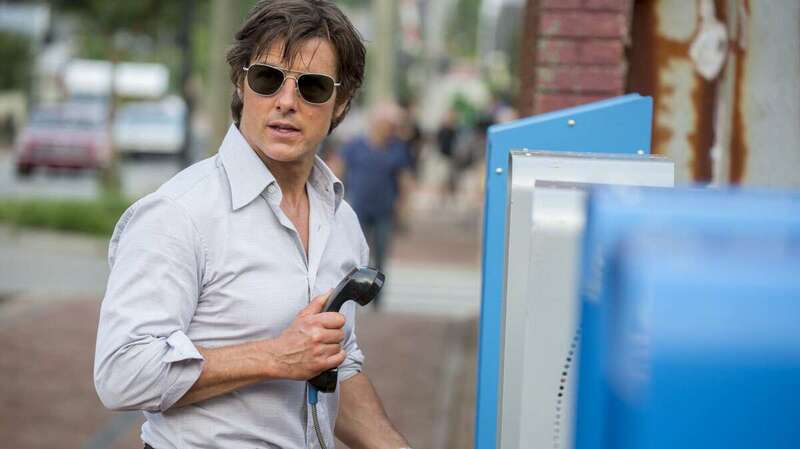 I'd Like to Fly the World Some Coke: In American Made, Tom Cruise plays Barry Seal, a drug- running pilot in the 1980s. Slickness is a virtue in American Made, a cheerfully blistering yarn starring Tom Cruise as real-life-TWA-pilot-turned-CIA-stooge-turned-cocaine-smuggler Barry Seal. Piquant and picaresque, it's essentially a hybrid of Goodfellas and Air America. Those movies — one rightly revered, the other all but forgotten — were released about a month apart from one another back in 1990, a long-ago cinematic era when either one might nevertheless have starred... Tom Cruise. He'd just scored an Oscar nomination playing real-life Vietnam vet-turned-antiwar activist Ron Kovic in Born on the Fourth of July, then immediately re-upped with Top Gun director Tony Scott for the NASCAR action flick Days of Thunder. Sure, Goodfellas was the best American film of 1990, but Days of Thunder grossed nearly twice as much. A few years shy of 30, Cruise had found the golden mean of artistic cred and bankability that few movie stars achieve. Four years later, no longer content to race stock cars at 200 miles per hour, he would earn his pilot's license. American Made director Doug Liman claims the star performed all of Seal's daredevil low-altitude flying scenes himself. We'd infer that, at this point. Among its other virtues, American Made takes the longest-lived, most hands-on A-lister in the history of cinema and gives him a line — repeated twice in the movie — that sums up his range and staying power better than anything Maverick or Jerry Maguire or the top-knotted MRA guru he played in Magnolia ever said: "I'm the gringo who always delivers." But I have seen American Made, and I am here to tell you it's everything you could want from a flashy true-crime biopic skewering the hypocrisy and malice of the Reagan Administration's covert war in Central and South America. That included the C.I.A. 's recruitment of skilled, flexibly-scrupled pilots like Seal to work as snoops and gunrunners. Gary Spinelli's screenplay takes liberties with the facts of Seal's life, but not with the sheer scale of the conspiracy. Liman calls the film "a fun lie based on a true story." That's notable only because it's a story to which the director has a personal connection: His father, Arthur Liman, was chief counsel of the Senate Iran-Contra committee of the late 1980s. By the time the elder Liman was among those questioning Oliver North about his role in government-sanctioned drug trafficking on live TV, Seal had already been dead for more than a year. In this telling, Cruise's Seal is so bored flying for TWA circa 1978 that he fakes an episode of turbulence, scaring a cabin full of passengers awake. The ubiquitous Irish actor Domhnall Gleeson, playing a white-collar spook who knows all about Seal's sideline smuggling Cuban cigars, fast-talks him into serving his country while also indulging his need for speed, setting him up with a sleek Piper Aerostar 600 equipped with special cameras. The scenes between Gleeson and Cruise are especially fun: Cruise's character is a huckster himself, so he knows he's being taken. Game recognize game. Seal is a reliable, daring pilot, but also easily led by the nose and good at keeping his mouth shut, so his employers turn a blind eye once he begins flying shipments of cocaine from Medellín, Colombia to Louisiana, dropping the bags in the swamp for pickup before landing. Liman shot on location in Colombia, and these scenes are alive with tension and detail, right down to the sweat stains that threaten to dissolve the fibers of Cruise's enviable wardrobe of pearl-snap shirts. Seal forms a not-entirely-voluntary compact with young Pablo Escobar (Colombian actor Mauricio Mejía), soon to become the Steve Jobs of coke smuggling. Liman and Spinelli do a good job with the practical how-tos of dope smuggling, and they make great comic hay of Seal's increasingly desperate attempts to launder or just-plain-store his gym bags full of cash. (A FBI agent drives down the main street of tiny Mena, Arkansas, where the Agency has set up Seal and his family once the local cops drive him out of Louisiana, and finds nothing but banks with fresh paint on their signs.) As competing law-enforcement agencies close in, the Reagan administration's shadow war — backing the Contras against the Sandinistas — becomes Seal's saving grace. Liman works in real clips of First Lady Nancy Reagan urging American children to "just say no" and the President answering reporters' questions about what he knew and when he knew it with bromides about how delicious his Thanksgiving turkey is going to be. A sub-two-hour movie covering an eight-year period inevitably means dollops of exposition, but Liman handles this adroitly, with a mix of animated segments and VHS video diaries from Cruise. Seal really made videos like this, so it doesn't feel like cheating. Cruise affects a mild Louisiana accent, but he hasn't gained weight or shaved his hairline back or made any other awards-baiting attempt to resemble the historical Seal, who was almost a decade younger than Cruise when he died. He's past all that now. The arguments for this are the same as the ones for casting Cruise as the tall, blonde literary antiheroes Lestat and Jack Reacher: His room-filling energy is more notable than any distinguishing physical feature. He's a huckster. He has the liar's superpower of being able to make himself believe anything he needs to believe. American Made is also a perfect fit for Liman, who began his career with the sweaty indie comedy Swingers, was nearly fired from the franchise-launching The Bourne Identity (Universal did not invite him back for the sequels), and found common cause with Cruise on Edge of Tomorrow, one of the shrewdest and most original shoulda-been-a-blockbusters of the 21st century. He's got almost as many misfires on his resume as hits, and that's because he allows a perceptible measure of chaos into his movies. In the case of even a fictionalized biopic of a guy like Seal — a man who literally flew by the seat of his pants, low enough to brush the treetops, until what would eventually become known as the Medellín cartel caught up to him in a parking lot — that Demme-esque wildness is exactly the right method. And Liman is tireless: He shot, edited, and released the micro-budget war thriller The Wall for Amazon Studios during the interval while American Made was in postproduction. He's at least as much a one-for-them, one-for me guy as Christopher Nolan or Steven Soderbergh. In American Made, he's found his shaggy-dog happy place: It's one for us.